Above: my buddies Lain, Jennings, and Van Carney. 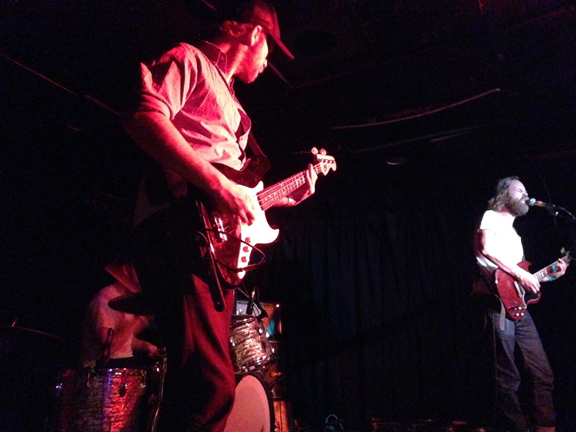 They’re from the Blue Ridge Mountains and they form the band Pontiak. I caught their set on Tuesday night in Denver. Their record is doing well in the U.S. and in Italy they are huge stars (no joke). The month of March is finally coming to a close. 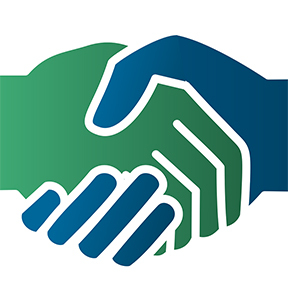 Work has taken me to Atlanta, Chicago, Los Angeles, Boulder, and Denver, and next week I leave for Italy for the Italian wine trade fairs and scores of meetings with clients, friends, and colleagues. I’ll land in Rome where I spend the night. Then on to Siena for a few nights and a short documentary that I’ve been asked to appear in. When I caught the Carney brothers set in Denver on Tuesday night, in a club where my band once played a raucous New Year’s Eve show, my mind was filled with memories of my life as a working musician on the road, in the U.S. and Italy. I miss the shows and the people but I can’t say I miss the travel: now, every day on the road is a day away from the family I love, the family that loves me. But I can’t complain: business is going well and there always seems to be something interesting in my glass for me to taste and to share. I’ll be taking a few days off from the blog as I get ready for my next adventure in Italy. Thanks so much for being here and for following along. It means the world to me that people enjoy the bog and find it useful. 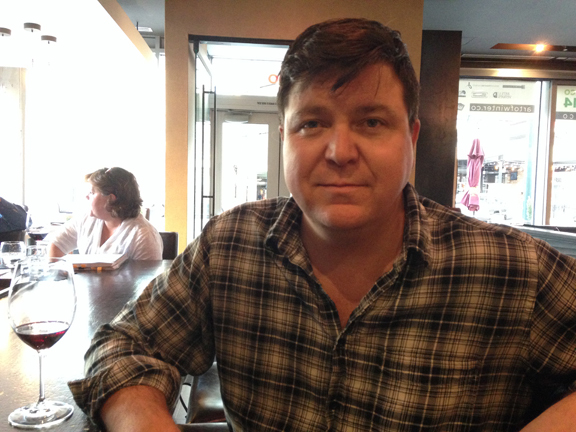 Above: career newspaperman Ricardo Baca — music and film writer, entertainment editor, a twelve-year veteran of the Denver Post’s staff, began forging a new language when he was tapped by the paper to launch the Cannabist, an online column devoted to the evolving marijuana culture in Colorado. “The alimentary language is evolved only from a broadly collective usage, or from a purely individual speech,” he observed. “One might consider cookery within one family, which is subject to a number of habits,” he proposed, “as an idiolect,” or a language intelligible only to one person or, in Barthes’ application of the terms, to an intimate family unit. This notion echoed a theme addressed in a previous work, Writing Degree Zero, in which he criticized the socialist realist writers of his time for their reliance on literary cliché: writing is always a balance between “collective usage” and the purely intimate language of the individual, he wrote. 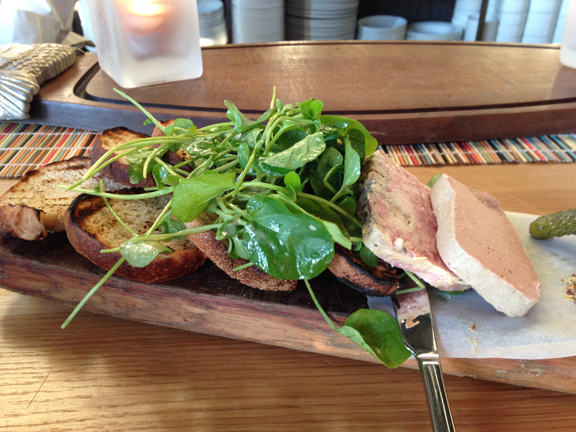 Above: the housemade pâté at Coohills in Denver, where Ricardo and I met for glass of wine earlier in the week. These notions on the nature of language and writing were on my mind when I met with Ricardo Baca (above), who made history last year when he became the editor of the first mainstream column on the culture of marijuana: the Cannabist, published online by the Denver Post, the city’s “paper of record.” Since the launch, Ricardo has appeared on the Colbert Report, MSNBC, NPR, and has been featured in the New York Times and the Boston Globe, among other high-profile mastheads. One of the fringe benefits of my new gig writing for Brett Zimmerman’s Boulder Wine Merchant is access to one of my favorite restaurants in the world, Frasca, in Boulder. 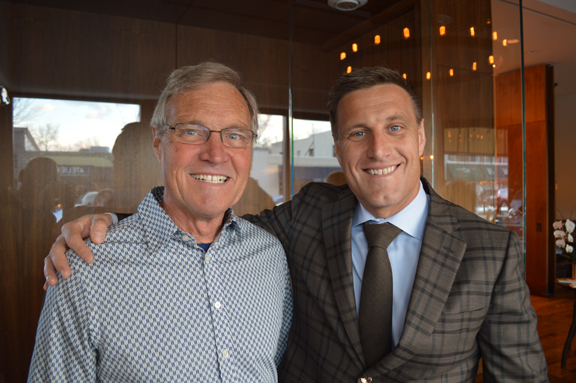 That’s Brett’s fellow Master Sommelier Bobby Stuckey (right), with his father (left), in case you didn’t notice the resemblance. I’m a big fan of Bobby’s dad. I still wear my pin proudly on my camera bag, which follows me nearly everywhere I go. And I was thrilled to meet Mr. Stuckey and thank him for his subtle yet powerful protest of this dishuman law. 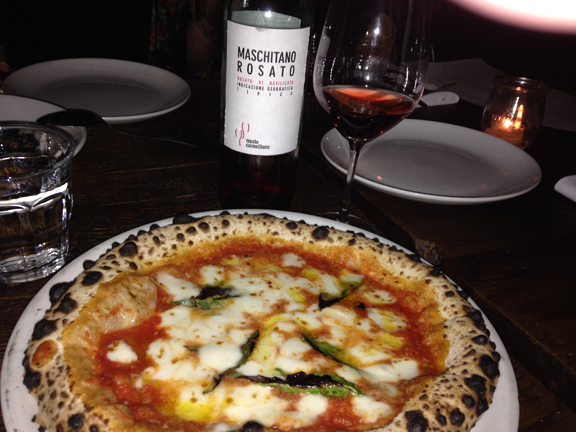 I didn’t have time for a proper meal at Frasca. 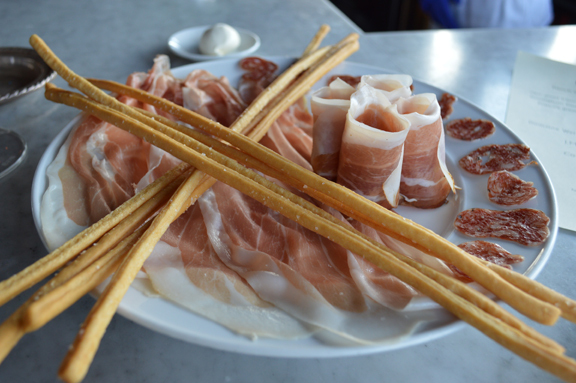 But there was no way I was leaving Boulder without a taste of the restaurant’s charcuterie plate, dressed with Prosciutto di San Daniele, speck, and cacciatorino. One of the most fun things about what I do for a living is that my colleagues always love to “taste me” on wines I’ve never had before. What a thrill for me when Master Sommelier Brett Zimmerman asked me if I wanted to taste the 2009 Barolo Paiagallo by Canonica, one of the appellation’s most coveted “cult” producers! Brett and his lovely wife Jenn had me over for dinner last night in Boulder, where Brett owns and runs the Boulder Wine Merchant and Jenn works as a lawyer specialized in the restaurant trade (more on my visit with them below). 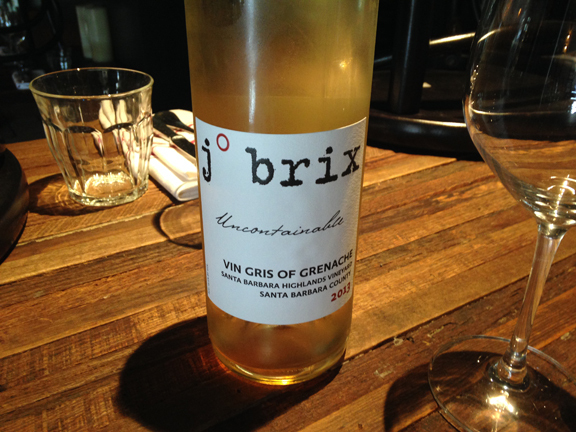 If ever there were a wine to be called sui generis, this is it. It’s entirely unique and it stands alone, instantly recognizable as Barolo but apart from the canon (similar to the way Soldera’s Brunello di Montalcino is an entirely idiosyncratic expression of its appellation). I love what the Barolo di Barolo website says in its profile of Giovanni Canonica, who owns just 1.5 hectares planted to Nebbiolo for Barolo: the winemaker “wants to stays as far away from the market” as he can, writes the author of the piece; his wines are “extorted” from him rather than “released” by him, says Canonica. And I love that this reluctant barolista has named his farm and agriturismo after the iconic painting, “The Fourth Estate,” by twentieth-century master Giuseppe Pellizza da Volpedo. It’s one of the most extraordinary (literally) bottlings of Barolo I’ve ever tasted, a wine that wears its ideology on its sleeve, and I highly recommend it to you. 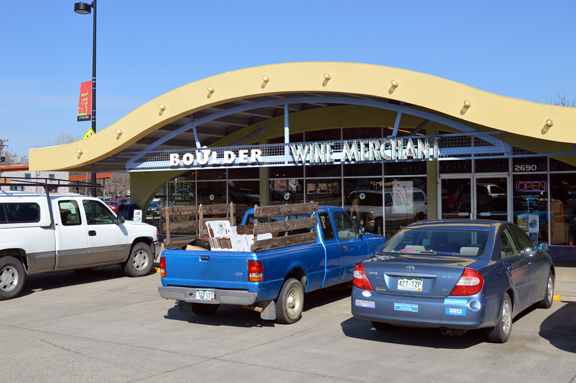 I’m in Boulder today because Brett has asked me to become a regular contributor to his shop’s blog. I’ve already begun to publish some wine education posts there and as our work together expands, I’ll be posting on featured wines, wine tourism, and Brett’s work as a wine educator and Master Sommelier (he recently returned, for example, from La Paulée San Francisco, where he and team of his fellow Master Sommeliers oversaw wine service for the event). Brett and I have known each other for more than seven years now and I’ve always enjoyed following his work and his seminars at TexSom, the annual sommelier gathering in Dallas. He’s one of the nicest people in the trade and I am entirely geeked and proud to be working with someone of his caliber. I’m also excited about having an excuse to visit Boulder a few times a year. There are more Master Sommeliers and top-notch wine professionals here pro capite than anywhere else in the country and the general level of food and wine connoisseurship here — among professionals and consumers — is remarkable. It’s one of our nation’s new meccas for gastronomy and I love it here. Stay tuned… my two-day Colorado adventure has just begun. 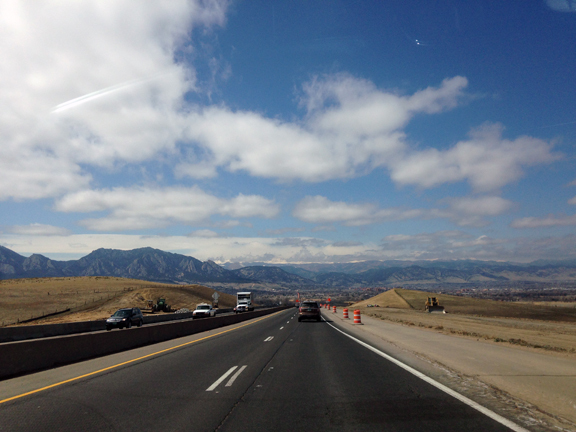 Heading to Boulder this afternoon to meet with a new client that I’m very excited about. Such beautiful country up here! In Los Angeles yesterday and today, tasting for our new spring list at Sotto where Captain Wine and I author the list together. Here are some highlights. Thanks again to all the reps who came out to taste us on their wines! Outrageous behavior might work against you when you need to send back a bottle of wine at a restaurant. 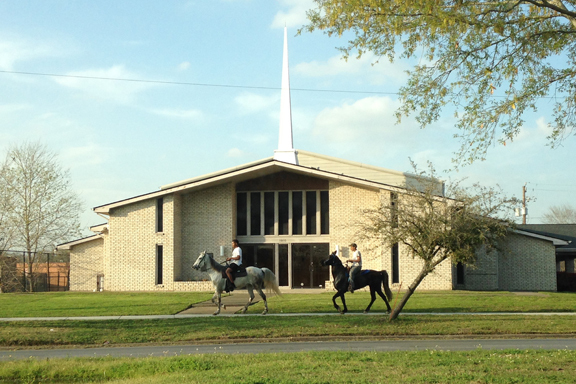 Snapped this photo on my way to Hobby Airport yesterday, driving along Bellfort, a major thoroughfare that traverses urban Houston. As you approach the airport, there are a bunch of urban ranches with all kinds of livestock. Above: Monforte d’Alba, where some of the greatest expressions of Barolo are produced, fall, 2012 (photo by David Berry Green). It’s one of those linguistic questions that comes up often in my world: what is the proper English pluralization of Italian wine names like Barolo, Brunello, Barbaresco, and Prosecco, Italian proper nouns that end in <o>? 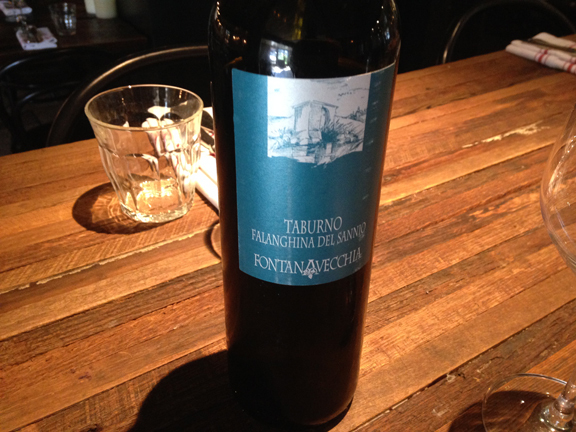 A few days ago, when one of my favorite Italian wine bloggers, the amazing Ken Vastola (check out his super cool site), asked me to share my thoughts on this conundrum, I decided to sit down and right a proper post about it (excuse the paronomasia). Technically, enonyms ending in <o>, like those above (and all enonyms, for that matter), are singular, masculine, invariable nouns in Italian grammar. And as invariable nouns, their plural and singular forms are the same. But many Italians will pluralize them based on standard inflection. Just as the plural of pomodoro is pomodori or cannolo is cannoli, where the final <i> makes the words plural, it’s not uncommon to find inflections of wine names like Baroli or Brunelli. And similarly, English-speakers will commonly pluralize them as Barolos or Brunellos. There’s nothing “incorrect” about inflections like these: the “correctness” of grammar is ever shifting and the evolution of language is based not on an unattainable ideal but rather practice and usage. Thirty years ago, there were very few English-speakers in the U.S. who would wonder what the correct plural of Brunello was, let alone know that Brunello was a prized wine. Today, wine lovers, wine merchants, wine writers, and editors are often challenged and sometimes vexed by the question of how to pluralize Brunello. Would he have been faced with the issue in 1984 when he published Bright Lights, Big City? But they are best to avoid. The reason is that this type of hypercorrective inflection often distances the word itself from its intended meaning. In the case of Barolo, for example, the enonym is a toponym, a unique place name: Barolo, the village in Cuneo province, Piedmont. When hypercorrectively pluralized as Baroli, the toponym becomes cacophonous (the opposite of euphonious) to the Italian speaker. The same holds for Prosecco, which is also the Italian name of a village, Prošek in Croatia. If, for example, you were writing about a flight of wines made from Cabernet Sauvignon grown in Napa Valley, California, you might cacophonously abbreviate the grape name Cabernet Sauvignon as Cab (cacophonous, at least to my ear). But it’s unlikely that you would hypercorrectively pluralize the place name Napa as Napas. It would — more likely than not — sound strange to you. There are also instances where the enonym is a homophone in Italian. Barbaresco is the name of a village. But in literary Italian, barbaresco can also mean barbarian or barbaric. To pluralize the wine name as Barbareschi (where the <h> is needed to retain the velar consonant in the pluralized inflection of co; pronounced koh and kee respectively), not only corrupts the toponym Barbaresco but it also creates a superfluous homonym. In my view, the best way to address this issue is to avoid it gracefully. In my writing, you’ll often find instances where I use the phrase expressions of Barolo to avoid the wine name’s pluralization: “Monforte d’Alba, where some of the greatest expressions of Barolo are produced.” Bottles of or bottlings of are other common solutions to the problem. And there are plenty of other ways that writers can avoid this type of hypercorrection. As I wrote above, it’s not “incorrect” to say Baroli but it’s preferable to avoid it (the pluralization of euro as euri, as opposed to sing. invar. euro, is an analogous example where both usages are accepted in standard Italian grammar, but the former is preferable). Just think how a hypercorrective inflection of Montepulciano d’Abruzzo would sound to an English speaker or Italian speaker, where the wine name includes a grape name and two place names (one homophonous). Montepluciano d’Abruzzos? Monteplucianos d’Abruzzo? Above: on Sunday morning we took the girls to the Renzo Piano-designed Menil Museum in Houston to see its awesome collection of Magritte paintings. 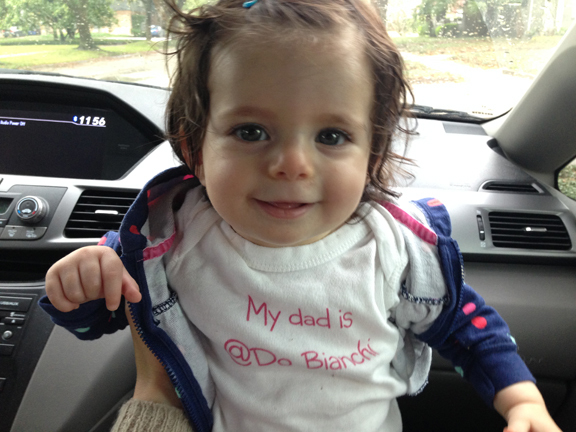 That’s Lila Jane wearing her “my dad is Do Bianchi” t-shirt, given to her by Vinogirl. Things were a little heavy last week here on the blog. I really appreciate all the folks who shared my post on Friday and offered words of support and solidarity. It was hard to write but I felt it was important. 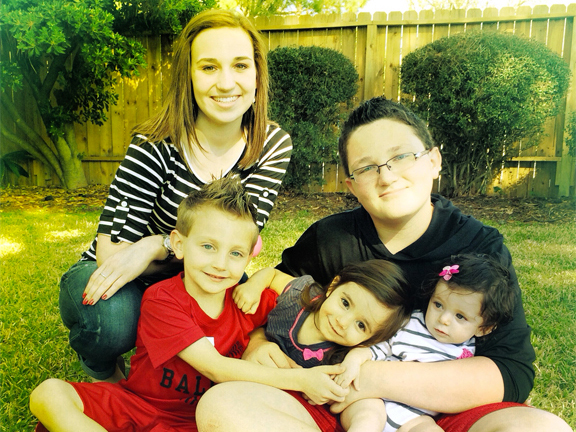 Above: The girls’ Levy cousins, who live here in Houston, came over to play on Friday. We’re so blessed to have a family that loves us. 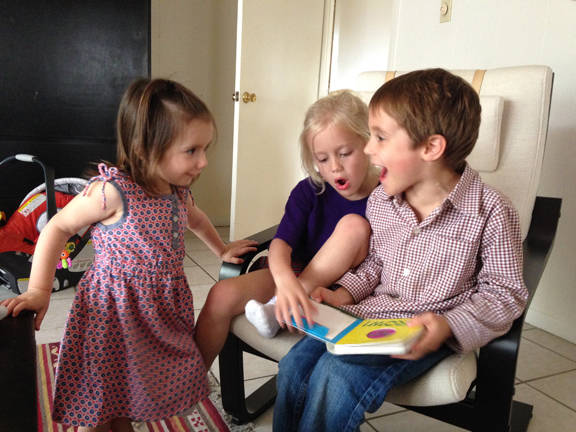 From left, that’s Georgia P, Josie, and Colin. 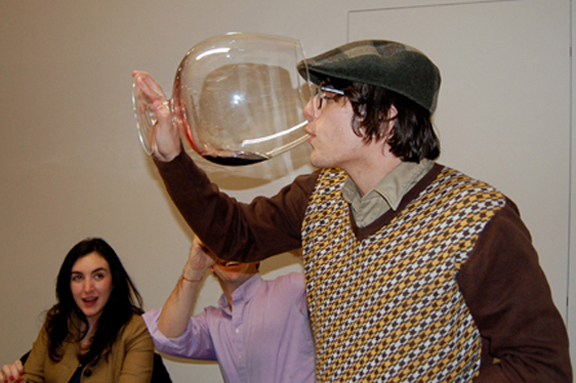 On Friday, Alfonso aka “the Italian wine guy” posted an excellent aggregate of online Italian wine resources. I was honored to be part of it and I really like his note on how true wine appreciation is like learning to play a musical instrument. Practice, practice, practice… It’s a great post, on many levels (and Alfonso’s blog has never been more exciting imho). Above: the Branch cousins came in from Orange, Texas for a few days earlier in the week while I was in Chicago. The main reason for our move to Houston was to be closer to family and we are so lucky to have them. Clockwise, Tobey, Emilee, Brady, Lila Jane, and Georgia P in the center. 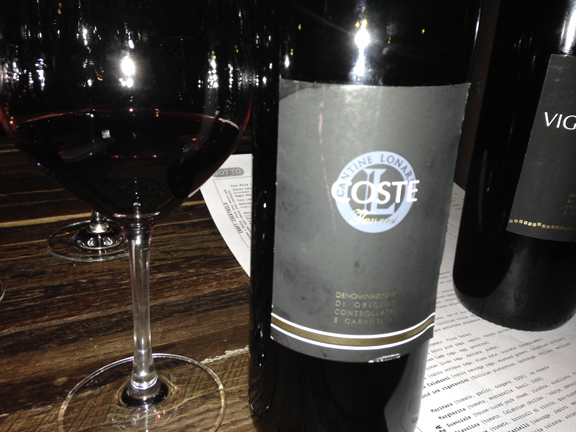 On Friday, I translated this post on the Bianchetta grape for my client Luca Ferraro at Bele Casel. 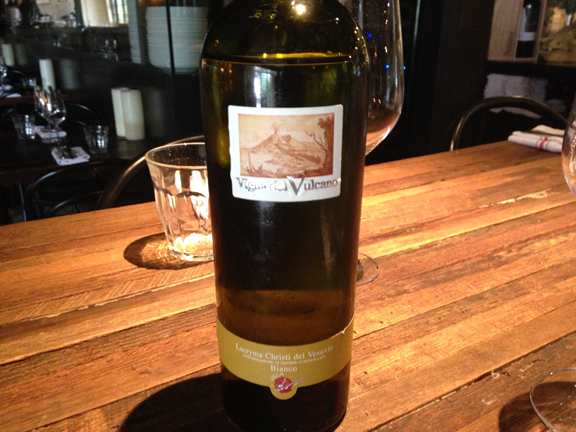 Luca’s working with some old-vine Bianchetta that he found in a newly purchased vineyard. I really love Luca’s approach to biodiversity and his embrace of traditions that span far beyond the Prosecco boom. With Glera so widely planted in Asolo-Conegliano-Valdobbiadene (thanks to its lucrative returns), Bianchetta is an underdog these days. It’s going to be really interesting to see what Luca does with these old plantings. Check out the post here. 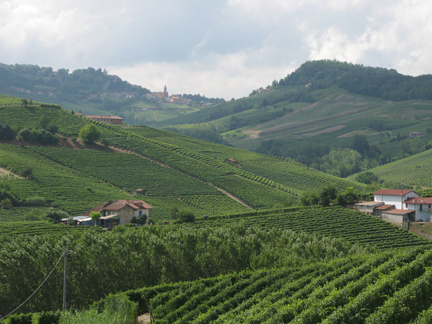 You might be surprised by Bianchetta’s role in Veneto viticulture before the Prosecco advent. Above: we are so fortunate to have daughters who love to eat. Friday marked our third week in the new house in Houston. We love it here and we love our new home (a fun Mid-Century Modern three-bedroom in a nice neighborhood just outside “the Loop”). Saturday, Tracie P and I had our first date night since we’ve moved: we went to Tony’s and were treated to the best table in the house and butternut squash gnocchi topped with Norcia truffles among other delicacies. And Sunday, we threw our first Houston dinner party (Tracie P’s Carbonara paired with Selvapiana). It’s a really special time in our lives and our blessings are too many to count. Thanks for being here… More groovy stuff to come this week.